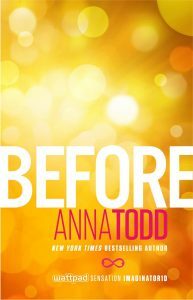 I’m so thrilled to host an exclusive, exciting campaign with the talented Anna Todd!!! Starting today, we’re kicking off #5DaysBefore—5 days of exclusive, never-before-seen content and giveaways as we count down to the highly anticipated novel Before, told in Hardin’s POV. Today, I’ve got a guest post from Anna, where she talks about what to expect, as well as a not-to-miss contest and giveaway. Also, I got to write some fluffy stuff about their future and the other characters, which is always fun! I’m really thrilled to work with Vilma and her blog this week… we have some exciting things planned! You’ll definitely get some early scoop as we countdown the days to Before. Make sure to check my page or Vilma’s page daily. Enter to win a personalized, signed copy of Before! All you need to do is create any kind of teaser graphic using one of the below three quotes (see example below). Share on social media and use the hashtag #5DaysBefore. Anna and I will be stalking Instagram, Twitter and Facebook, and we’ll pick three winners on Sunday evening. Winners announced on Monday, December 7th. Win a signed copy of After, just enter the Rafflecopter below and share this post with the hashtag #5daysbefore! Giveaway closes Friday at midnight CST, open internationally. We’ll have a new giveaway tomorrow!